The more regular readers of this blog will recognise and remember this image. I rather like it. It seems to encapsulate attitudes among some to electoral fraud. Further to yesterday’s post about the report of the Electoral Commission and the Metropolitan Police, I commend Andrew Gilligan’s blog on the matter here. And since then the political parties in Tower Hamlets have issued their own press releases. 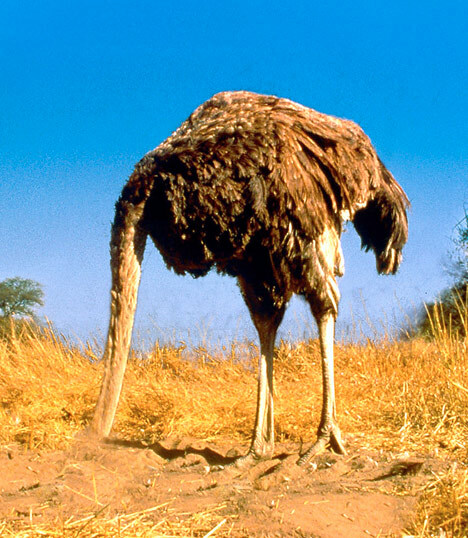 Two recognise there is a problem, while the third….well….let’s say it takes something of an ostrich view. Mayor Lutfur Rahman and Tower Hamlets Council vindicated after Electoral Commission finds “insufficient evidence” to back opposition claims of widespread deception. Sometimes I do wonder whether his press releases are part of some massive operation to wind me up and that Lutfur will one day reveal himself as an east London version of Joaquin Phoenix. If not, I suspect that press release will cause deep, deep divisions between the Mayor and his friends in Respect because George Galloway and his aide Rob Hoveman were forever questioning the robustness of the electoral system in Tower Hamlets (eg p113 on this link). And so were many their Respect councillors back then. Oh, hang on, didn’t they include the likes of Oli Rahman, Shahed Ali, Lutfa Begum and Rania Khan….? My, how they’ve managed to clean up the system since they’ve been in power! The Metropolitan Police Service identified three cases involving five allegations where they thought electoral fraud may have taken place in relation to the April and May 2102 elections in Tower Hamlets. Sadly the MPS concluded that there was insufficient evidence to prove an offence or identify a suspect and no further action was able to be taken in these cases. In those cases two legitimate electors may have been deprived of their right to vote, and closer election results could have been subject to challenge. The Electoral Commission stressed the importance of recognising that even one case of proven electoral fraud can damage confidence in the integrity of elections. The Commission stressed that without taking steps now to begin rebuilding confidence and trust between the key participants in the election process, we are concerned that the May 2014 local elections will again be damaged by allegations of electoral fraud. that the Metropolitan Police Service should review its plans for policing elections in 2014 in conjunction with the ERO and RO for Tower Hamlets. The Electoral Commission will monitor closely the plans and approach of the ERO and RO in Tower Hamlets and the MPS during the 12 months leading up to the May 2014 elections, to ensure that what they propose will be an effective response to improve confidence in the integrity of future elections. They will review and comment on any plans published by the ERO and RO for Tower Hamlets, including actions. “Improved monitoring and transparency on the part of the Registration Officer and Returning Officer and increased scrutiny on the part of the police is welcome and necessary and has long been requested by the Labour Party in Tower Hamlets. “However, the primary blame for this problem must lie with the individuals who believe that electoral fraud is a legitimate tool in fighting elections in Tower Hamlets. This report must be seen as a clear indication that such behaviour will never be acceptable and that the authorities will take action to prevent such abuses and to fully pursue legitimate allegations of fraud in the future. Allegation that occupant said that two electors, shown on register as postal voters, did not reside at property. Two postal votes were cast at by-election. The ballot papers were rejected but not suitable for forensic testing. Police called at the property and spoke to two occupants but were unable to identify a potential suspect. Allegation that postal votes were cast by two people who appear on the register as living at an empty property. Police confirmed that the property appeared empty and two votes were cast. The investigation concluded that the inclusion of these names on the register may be due to an administrative error. The names have been removed from the register. No further action – undetectable. Allegation that the two electors named on the register as postal voters were not resident at the property. Council pre-printed 2011 canvass forms were signed and returned. Both residents deny they signed the forms. This is an offence however the victims would not assist police and the offenders may be undetectable. Names removed from register. I welcome the detailed report by the Commission to concerns about the electoral process in this borough. Concerns that have been repeatedly raised by candidates, residents and the media over several years. For too long these matters have been ignored or brushed aside. The Electoral Commission, in calling for significant changes to the management of elections in Tower Hamlets show that they have taken these matters on board. More importantly are the criticisms of the Metropolitan Police in their “investigations” of malpractice. Even now it would seem that the investigating officer based responses from the council in reaching his conclusions. My evidence was not based on outdated registers, it was based on the official register used on both election days and on the relevant official postal vote return. I have previously submitted evidence to the police and received no response. With regard to 2012 I had a single interview, which I personally requested, weeks after the election, when any trail of malpractice would have gone cold. I had spent considerable time and effort in undertaking detailed research, and I reiterate, using the registers and postal vote lists that were operative on both the GLA election day and April 19th, polling day in the controversial Spitalfields by election. Despite this single interview, until receipt of this report, I had never been informed about the conclusion of the investigation. The Met needs to establish a unit that understands not only election law but the electoral process, just as they have specialists in fraud. The West Midlands Police were eventually castigated for their inability to properly investigate electoral fraud. With this in mind the Met must accept the concerns of voters and take action to properly police electoral malpractice. The fact that the electoral commission make such firm recommendations show how they appear to share local concern about the integrity of the electoral process. Now both local officials and the police need to work on this and not dismiss concerns out of hand, as has been so common in the past. Both need to regain the confidence of the public in the electoral process in this borough. We should do what they do in Bangladesh (oh the irony). To register to vote, you need to provide current ID and a photograph. Only doctors can authorise postal votes and to get your ballot paper at the polling station, where you must produce photo ID and that is checked against the photo on the register. … or even the system used in Afghanistan where you put your finger in a pot of red ink when you vote, thus marking you as having voted and hence not allowed to vote again. Not sure how this would work with postal votes, but we only need simple solutions. John seems to have hit the nail on the head as to some of the mechanics of a solution, however, I reiterate that the process would need to be carried out independently of LBTH. Labour’s comments are a bit rich ““Improved monitoring and transparency on the part of the Registration Officer and Returning Officer and increased scrutiny on the part of the police is welcome and necessary and has long been requested by the Labour Party in Tower Hamlets.” – Well, prior to Lutfer, who is only lately out of Labour, and not by choice, they had plenty of time to do something about it. Suddenly its working against them… oh dear. well if there’s no evidence, there’s no case and I doubt 5 votes would have swung it for anyone. Another non-story. Let’s have some REAL news. not smoke and mirrors. that’s boring. Are the politicians doing the job they are supposed to, etc. @Tim, may be the postal voters can send one of fingers with the ballot paper. Would that suffice? Or do you think they need to send their bum print too? This issue has been talked about, reported and now investigated by the authorities but the sour grapes are still moaning about it. Accept it gents, voters in TH don’t follow the national trends. It’s local issues, local voting trends and truly local government. Sorry to be a party pooper, but I think the reason there’s not much interest in this story is that you and others have said this stuff before, it’s been investigated now and the police didn’t find anything. Why try so hard to keep it going? 164 cases – and only THREE cases where there MAY have been anything untoward. In other words, in 161/164 cases nothing could have gone wrong. Whoever made those allegations was pretty wide of the mark! Gulam won by a lot more than three votes. Yes, the report makes recommendations for improvements – but these are generally geared at repairing the break-down of trust in the system, in a ‘justice must not only be done, but be SEEN to be done’ way. It’s reporting like this, without any substance, and particularly the stories on Gilligan’s blog and in the Evening Standard – which seem to take the view that irrespective of evidence, there MUST be electoral fraud because there’s a high concentration of people with brown skin – that forms the basis of that breakdown of trust. You sound like someone who’s not see that many elections in Tower Hamlets. That electoral fraud happens is not in doubt among those who have seen a few. Galloway, Oli Rahman, Shahed Ali and Rania Khan were right. They’d all seen enough evidence to know it goes on. As have the various reporters who’ve talked to people first hand. That the Met has been consistently unable or incapable, Andrew Mitchell style, of finding the required level of evidence to trigger a prosecution does not mean it is not going on. I talked about ostriches in my post. Now look at the disgraceful write-up in today’s East End Life and explain to me why the most relevant section of the Electoral Commission report – its warning of a breakdown of trust between senior election officials and councillors – has been omitted completely. Anyone needing proof that the paper and its senior and experienced journalists have been hijacked by disingenuous PR slimeys need look no further. So yours and Gilligan’s write ups- how do they compared to what old Lutfur wrote then? Models of fairness? Seeing he was all but accused of electoral fraud, are you surprised he’s written it up as it is? I think he’d be justified in saying that the report didn’t find any evidence of fraud was the important bit, don’t you? You know what I think happened? Gilligan went mad for this because there was a mayoral election going on. It happened in 2008- Lee Jasper. Sod all happened afterwards. 2012- Lutfur Rahman. See a pattern here? You’re right, there have been allegations in the past. Problem is the allegations came flying in on these two by-elections, which I wouldn’t have thought were worth the trouble of cheating in, given that the mayor holds power. What could Robbani do as a councillor that he couldn’t do as a mate of Lutfur’s? The report details all the allegations and what the follow up found. Can you tell us which you aren’t happy with. So despite Robbani and the Mayor being vindicated by the Electoral Commission and The Met Police you’ll continue to obfuscate and publish about voter fraud Ted? See that’s the reason why some people vote for Lutfor? Why? because despite the lack of evidence and due process you and Gilligan continue to pedal blog post after blog post on to fit your warped narrative. Ted, you should work with your compatriots to engage the whites voters, the non Bengali voters and the disenfranchised Bengali voters, there’s plenty of them. Show them there’s an alternative to Lutfur. Learn from the passed. Attacking Lutfur in the passed made him stronger. In your desperation you are attacking the Council officers, the election commission, the police. You’ll be turning on the dustbin man next. This policy is doomed. Lutfur is miles ahead in planning for the next election. All you’rev doing is sulking about the last one. Hope the Labour party is listening. Like others, I’ve been writing about election fraud and the inadequaces of council control and police investigations into it before Lutfur was even a twinkle in Shiraj/IFE’s eyes. The health of the democratic process in Tower Hamlets is dire and I remain shocked that two senior journalists (and NUJ members) like Laraine Clay and her deputy Helen Watson allowed such a disingenuous article about the Electoral Commission report to appear in East End Life. Maybe they were returning a favour to Lutfur for raiding reserves to put a stay of execution on the paper. Gutless really. I hope you can see the irony in what you have written Ted Saheb, coming from you. I agree with Imran. We need a credible alternative to Lutfor Bhai for the sake of choice and healthy democracy. I think we’ve met on the Telegraph, haven’t we? More than anything, I just want this damned directly elected mayor stuff abolished. All the white v Bengali stuff vanishes instantly when that happens. I believe places in the UK with “city status” (which thankfully LBTH will NEVER have) and the Greater London Metropolis itself should each have directly elected Mayors with broad powers. This should be their standard mode of government. However parts of cities, individual London Boroughs, boroughs, districts and counties should NOT be able to choose a mayoral government and should be governed by a council who choose a leadership team from amongst their own number. Labour created a total hotchpotch of local government (like much else) with councils run in a variety of confusing ways from normal councils to “cabinet-style” councils to ones with elected mayors…even counties can be run by elected “mayors” which is ridiculous. I think John Biggs would be an excellent alternative. If only the sour grapes stopped complaining get off their high horses and engage in local politics, he could have a real chance. I doubt it though, they’ll be too busy searching the electoral register for Mr Miah here Mrs Begum there and completely miss the big picture. What do you mean about engaging in local politics? Do you mean doing basic things like cleaning the streets and fixing potholes? The kinds of things that aren’t being done v well, in fact. Or do you mean signing large cheques, bankrolled by everyone, for the benefit of a few community groups with narrow interests? What’s the evidence street cleaning isn’t being done very well? I see them all the time in Bethnal Green Road. Considering all the mess from the market and houses without places to leave their rubbish, they do very well. I very often call the number to report fly tipping, Always gets answered promptly and the crap’s picked up within a day. If a street’s messy, call them and they come and clean that. What do you want them to do? But of course, all the money goes on mosques, eh? I’d like them to clean the streets where I live in Bow, or any other street that’s not covered by a market cleaning team. You’re v lucky in Bethnal Green. But shouldn’t each part of the borough be treated equally? Yes, exactly these sort of things. Lets find out which organisations are receiving how much? And if they are all narrow interest as you put it. I’d like to see some evidence behind your statements. I just don’t quite buy the parallel reality where the Met police and Keep Britain Tidy (who recently named Tower Hamlets the best nationwide for cleanliness) are in some kind of pro-Lutfur conspiracy with the IFE. Wake up. Labour are the root of the problem, locally and nationally. Who are these “sour grapes” Imran? Do you mean those unfashionable working-class white dudes whose communities Labour utterly destroyed… the same ones that Labour is now so desperate to court ever since the Bengali block vote they were once so good at managing fell apart, do you mean those sour grapes? Nope, I can assure you that they won’t be voting for John Biggs. And by “engage in local politics” is that some form of NewSpeak for “vote Labour”? Well, let me assure you that Labour has lost their vote forever and it seems quite obvious that unless John Biggs can get a majority of the Bengali voters behind him (which you and I both know he won’t) is guaranteed to LOSE this election and that is not because of Lutfur’s skill but down to the abysmal local Labour Party which long ago stopped standing for anything except narrow minority interests and the vainglorious pursuit of power. So I recommend you forget all those plans you’ve made about plum jobs after the election because it isn’t going to happen. After reading Peter Golds’s words this whole situation almost reminds of the film ‘Invasion of the Body Snatchers’. First you’re ignored, then you’re paranoid, then you’re crazy, then you’re scaremongering and finally you’re a threat… and then it’s too late.